Yuan Zhi Relaxing Shower Gel. Yuan zhi root with vanilla and ylang ylang. Perfect for those with busy lifestyles, this bath & shower gel is our yang to the yin. The way we blend it. Use when bathing or showering. The aroma is described as floral, but I would suggest more exotic. Best used when relaxing in the bath in the evening. The aroma. It is addictive. I was with this in my evening bath and I keep washing and washing just to absorb the gorgeous smell of this product. I am addicted to it. 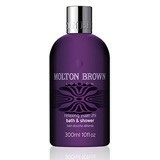 I love Molton Brown and there are two products that are top of my "will always invest in" and this is one of them. The other is Warming Eucalyptus. Both are addictive. "The aroma is described as floral, but I would suggest more exotic. Best used when relaxing in the bath in the evening."